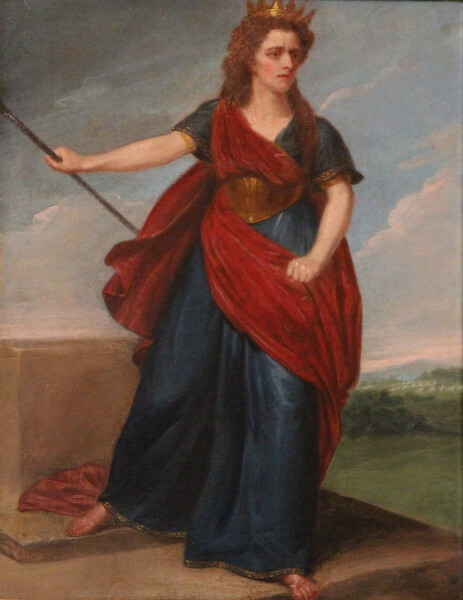 Boadicea descends the steps of the altar with her left hand clenched and a spear in her right hand. She wears a loose blue dress and billowing red mantle, with a gold crown and bronze stomach plate. Glover's tragedy, with "new pieces of music between the Acts, adapted to the Play, and composed by Dr. Boyce," was first performed at Drury Lane on 1 December 1753, with Mrs Pritchard as Boadicea. Jane Powell never played Boadicea in London.